PCA has started construction of its new full-line corrugated plant in Marshfield, Wisconsin. The Marshfield plant will replace an existing plant in Colby, WI. 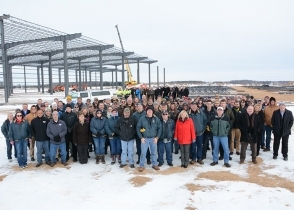 April 2, 2018 - Packaging Corporation of America recently celebrated the start of construction of its new full-line corrugated box plant in Marshfield, Wisconsin. Attendees at the official groundbreaking included PCA management; the mayor of Marshfield and other city officials; the builders of the new facility; and employees from the nearby Colby plant, who were transported on coach buses to Marshfield for the event. PCA Executive Vice President Tom Hassfurther addressed the audience and participated with others in a ceremonial groundbreaking. The event also included lunch served inside a warming tent. PCA's new, state-of-the-art plant will replace the existing plant in Colby. Many of that plant's long-time employees will continue to work at Marshfield, which is about 20 miles from Colby. The new facility is scheduled for completion later this year. PCA is the fourth largest producer of containerboard products and the third largest producer of uncoated freesheet paper in North America, based on production capacity. PCA operates eight paper mills and 94 corrugated products plants and related facilities. To learn more, please visit: www.packagingcorp.com.